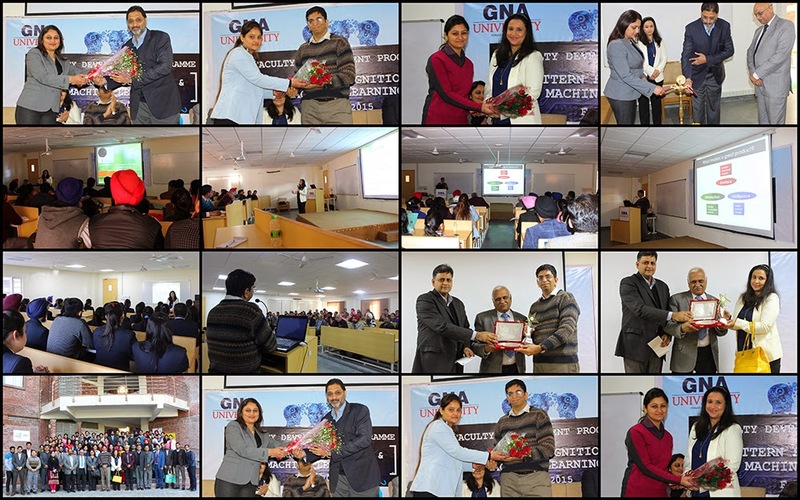 Faculty Development Program on “Pattern Recognition and Machine learning” was organized by Faculty of Computational Science, GNA University at its campus on Feb 7, 2015. Mr. Gurdeep Singh – Pro Chancellor, GNA University & CEO GNA Duraparts Ltd and Dr. Prem Kumar inaugurated the session and laid emphasis in their speech on equipping the teachers with the updated knowledge so that every teacher can give to the student what is actually required in the industry to improve the employability of the students. The session was on invitational basis which was attended by over 100 faculty members from different educational institutes around doaba region. Ms. Monika Koshy, Founder - Nurture Software Solutions Pvt. Ltd.
Banglore started with first technical session on “An Entrepreneurial Journey” and gave emphasis on reducing the industry academia gap. She stressed that to bridge the gap not only sharing of knowledge is enough but the interaction more with the industry should enhance through application of knowledge. During the second technical session delivered on ‘Indexing to Intelligence’ by resource person Dr. Shailesh Kumar – Researcher at Google Inc. Hyderabad shared that critical thinking and problem solving approach is the key to master any technical issues. He advised that teachers should avoid telling the students what they need to do and they should enhance innovative & analytical thinking among the students. Dr S K Singla Director GNA- IMT, Mr Sunil Sarad Sr GM (Corporate Affairs) and Mr Bhupinder Singh- Head HR & Admin also graced the occasion.